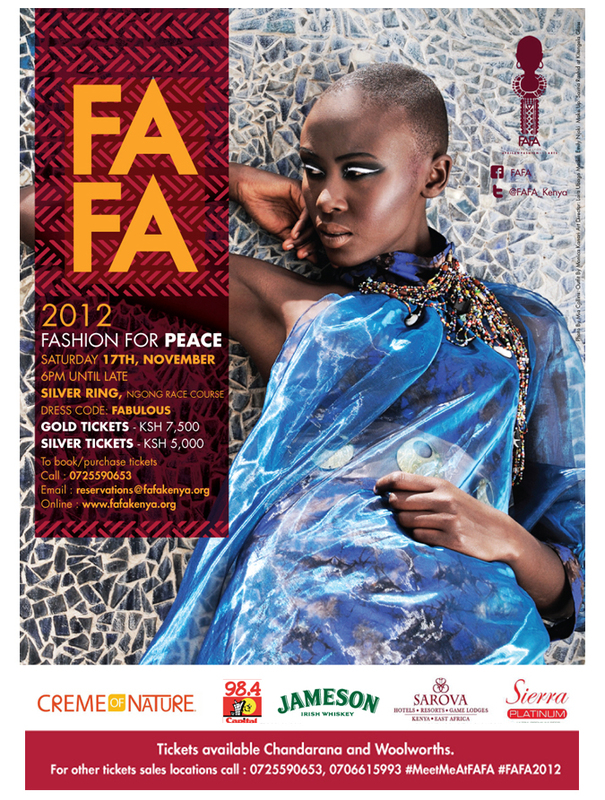 FAFA was formed in 2008 by Kiko Romeo Fashion designer Ann McCreath, has always been spearheading peace as it was purposely formed during the post elections violence period. "FAFA has always been about peace. A channel for young Kenyans to showcase their fashion and design talent so that when the international media reports about Africa. There can also be some positive story out there," Said Ann. According to McCreath: "Peace must exist to bring out the best in ourselves and our communities. We all love Kenya, and so I have faith that as we vote we will use our intelligence and sensitivity to rise above political differences and embrace our diversity as a nation. FAFA shows that there is so much to gain by opening our minds and using creativity as a bridge between cultures". The event featured international guest designers of Menswear & Womenswear; B'ExotiQ (Ghana), Gloria Wavamunno (Uganda), Mudi Africa (Nigeria), Zekaryus Solomon (Eritrea/UK), local designers; Anna Adero, Deepa Dosaja, Embody Accessories, Kaveke, KikoRomeo, Kondakis, Kooroo, Monica Kanari, Riri Jewellery and Winners of FAFA Insight emerging designers competition Jamil Walji, Azra Walji, Galina Tatarinova and Ogake Mosomi. Festival for African Fashion and Arts organisers have called for peaceful elections next year ahead of their fashion for peace event.